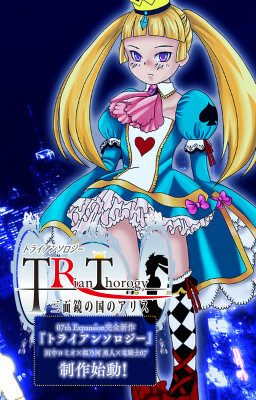 TRianThology ~Sanmenkyou no Kuni no Alice (トライアンソロジー ~三面鏡の国のアリス~, TRianThology ~Alice and the Three-Sided Looking-Glass~?, shortened as TRianThology) is a Japanese visual novel by 07th Expansion. The story is divided into three parts: Vespio 2438, School Love Adventure, and Country Girl. Vespio 2438 involves a science fiction setting examining both war and aliens. School Love Adventure takes place in a galge school setting following a harem story. Country Girl follows the a group of high school friends who meet up with each other in the country side after previously drifting apart. All three stories are connected. The game was released August 31, 2016. TRianThology has been in development since 2012. The game's release was alluded to by Ryukishi07 to be during the 2014 winter Comiket. The game was officially announced on April 1, 2016 on 07th Expansion's official site. The game will be written by Ryukishi07 as well as Romeo Tanaka and Yuuto Tonokawa, with whom Ryukishi07 previously collaborated on Key's Rewrite. On July 11, 2016, TRianThology's official website updated with a PV meant to be the game's opening video. A demo of the game was made available on August 28, 2016. A manga adaptation of one arc of TRianThology, Country Girl, has been released on Nico Nico Seiga's official website. The three capital letters of TRianThology are meant to represent the three writers of the three different stories: Tanaka Romeo, Ryukishi07, and Tonokawa Yuuto. The title "TRianThology" is a portmanteau of the prefix "tri" and the word "anthology". The game is themed off of Alice in Wonderland. The tagline "Three-Sided Looking Glass" is a reference to Through the Looking-Glass. ↑ "ACen 2015 07th Expansion Panel #3: Ryukishi07’s Latest Work TRianThology Unraveled for the First Time". Archived from the original on 18 August 2016. ↑ "Ryukishi07's Diary". Archived from the original on 18 August 2016. ↑ "07th Expansion Announces New Work on April Fool’s Day, Possibly Not (?) A Joke". Archived from the original on 18 August 2016. This page was last edited on 17 July 2017, at 04:29.